Richard Maher is a fellow at the Robert Schuman Centre for Advanced Studies, European University Institute. 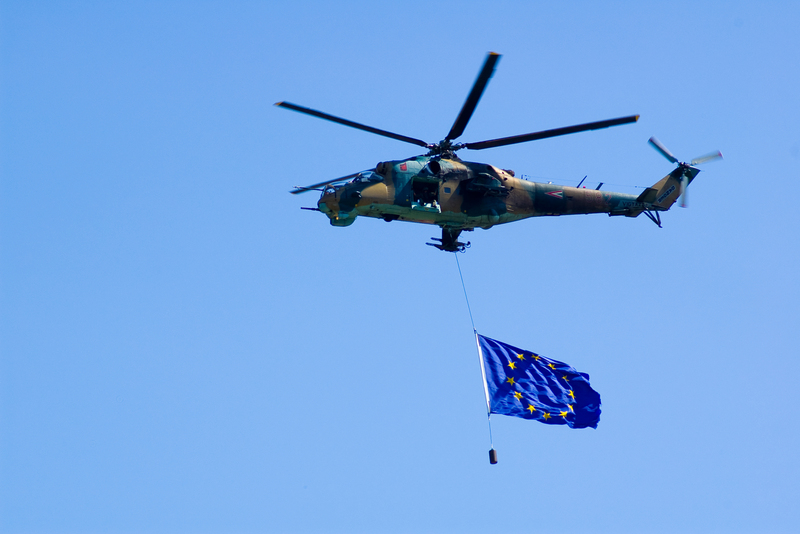 Since September, both the European Commission and individual EU member states have proposed a number of initiatives intended to improve Europe’s defence capabilities, such as establishing a permanent military headquarters, deployment of EU “battlegroups”, issuing “defence bonds” to purchase military hardware and the joint production of weapons and military technology. European leaders have long proclaimed their determination to achieve deeper security and defence cooperation. In the 1998 Saint Malo agreement, for example, Britain and France declared that the EU had to play “its full role” in world politics, which required endowing the EU with “the capacity for autonomous action backed up by credible military forces”. The 2009 Lisbon Treaty stated that “if an EU country is the victim of armed aggression on its territory, the other EU countries have an obligation to aid and assist it by all the means in their power”. The 2016 EU global security strategy affirmed this vision, announcing that defence cooperation among member states must become the “norm” and called for investments in “full-spectrum land, air, space, and maritime capabilities” to respond to external crises and keep Europe “safe”. Despite these appeals and ambitions, national governments remain in firm control of security and defence policy. But with the exit of the UK, which regularly opposed attempts at deeper integration of EU defence assets and capabilities, some EU and European leaders see an opportunity to make progress in a policy area that has long eluded them. But while virtually every European leader acknowledges that EU member states must coordinate their security and defence policies and activities more closely, there is little agreement over what shape this coordination should take or how far it should extend. The EU’s main security priorities today include securing its external border and preventing a catastrophic terrorist attack, such as one using chemical, biological, radiological, or nuclear weapons, from devastating one of its cities. The launch of a European Border and Coast Guard Agency and a Counter Terrorism Centre constitute positive if preliminary steps to address these challenges. Europe also confronts a Russia that is more aggressive and assertive today than at any point since the end of the Cold War. While the US has guaranteed European security for more than six decades, the election of Donald Trump, who has said that he would defend only those allies who paid their “fair share” to the US and who has shown an eagerness to accommodate Russian President Vladimir Putin, has caused leaders in Eastern Europe to question the reliability of US security guarantees. NATO will remain the premier security institution in Europe for the foreseeable future, however. Countries like France and Germany are not prepared to provide security guarantees to other EU member states and Europe continues to depend on the Washington for critical defence capabilities, such as logistics, command and control, and heavy airlift. Ambitious initiatives such as the joint development of expensive items such as helicopters, the deployment of EU battlegroups, and setting up a permanent headquarters for the operational command of EU military and civilian missions are likely to face resistance from national governments and military establishments across Europe. More than a decade after they were first proposed, EU battlegroups have still never actually been used. An EU army, as European Commission President Jean-Claude Juncker has advocated, is a non-starter for many national capitals. Previous attempts at joint development and procurement of military hardware, such as the A400M air transport carrier, inspire caution rather than enthusiasm for the prospects of future collaboration among European defence industries. And national militaries are loath to transfer operational control over civilian and military operations to multinational organisations. Not only are such initiatives likely to experience strong headwinds from national governments, they may also stir up a popular backlash among European citizens. Security and defence comprise core features of state sovereignty, and are among member states’ most sensitive and closely guarded policy areas. Governments, militaries and the broader public will be reluctant to see authority and influence in these areas flow from national capitals to more centralised institutions. The EU faces a watershed. Old certainties, the permanence of European integration, the retreat of geopolitical rivalry in Europe and the dependability of the transatlantic alliance, no longer seem so sure. National governments in Europe have long been reluctant to commit to closer defence coordination. But if Europe is to remain safe, secure and united for future generations, its leaders today must find ways to succeed where their predecessors failed. The best way forward is a general increase in spending by Member States under the NATO umbrella. A duplicate system would be costly and inefficient. The new NATO headquarters is big enough to host everybody. The EDA should be shut down. Its 30 million annual budget is meaningless in the overall scheme.